Sam Allardyce’s significant task in offloading Sunderland’s dead-wood has been reiterated, despite the release of four first-teamers yesterday. As expected, centre-half Wes Brown, strikers Danny Graham and Steven Fletcher, plus third-choice keeper Steve Harper will all formally part ties with Sunderland when their contracts expire at the end of the month after the Black Cats confirmed their departures. The exit of the quartet will free up a significant chunk on the wage bill, yet there were still a host of names that Allardyce is keen to move on, on the club’s retained list. Six players remain under contract - Liam Bridcutt, Will Buckley, Emanuele Giaccherini, Jordi Gomez, Adam Matthews and Santiago Vergini - who finished the season out on loan at other clubs and have no future at Sunderland. But at present, they are due to return to pre-season training at July 1 and Allardyce badly needs to remove them from the wage bill, as well as those who he decides to move on, such as Jeremain Lens. Yesterday’s announcement marked the start of Sunderland’s overhaul though, with Brown the longest-serving player departing after the ex-England international had spent the last five years with Sunderland following a £1million move from Manchester United. The 36-year-old’s previous deal expired last summer, but he was given a 12-month extension with a view to being a back-up option and he started six games last season. The Sunderland careers of Graham and Fletcher effectively came to an end in January when they headed out on loan to Blackburn and Marseille respectively. Fletcher was by far the more successful of the pair in a red and white shirt, even if he proved to be a frustrating figure in more than 100 appearances, during which he netted 22 goals. Both Fletcher and Graham leave for nothing after Sunderland had invested around £17million in bringing the pair to Wearside. Ex-Newcastle stopper Harper also leaves the club after arriving in January as a back-up option to Vito Mannone and Jordan Pickford. The only other player out-of-contract at Sunderland this summer was flop defender Valentin Roberge, but the Frenchman’s deal was terminated by mutual consent last month. 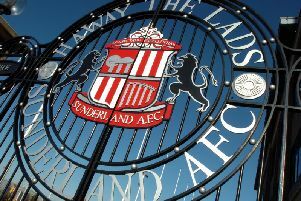 First-team players retained by Sunderland: Tom Beadling, Fabio Borini, Liam Bridcutt, Will Buckley, Lee Cattermole, Jermain Defoe, Emanuele Giaccherini, Rees Greenwood, Jordi Gomez, Lynden Gooch, George Honeyman, Billy Jones, Younes Kaboul, Wahbi Khazri, Jan Kirchhoff, Lamine Kone, Seb Larsson, Jeremain Lens, Vito Mannone, Charis Mavrias, Adam Matthews, John O’Shea, Jordan Pickford, Jack Rodwell, Josh Robson, Tom Robson, Max Stryjek, Patrick van Aanholt, Santiago Vergini, Duncan Watmore.